If Adelady was a food, it would taste like luscious apricot and peach, smothered in delicious milk chocolate. It would definitely be a bag of FruChocs! When friends leave our fine state, what do we send them in every care package? FruChocs. When it’s cold and raining, in the heart of winter, what do we crave? FruChocs. 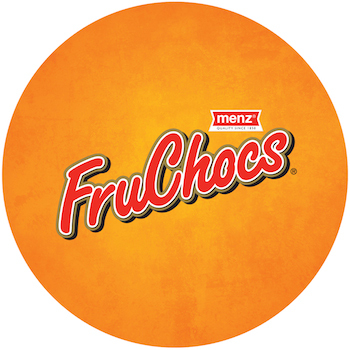 Menz FruChocs are SO Adelaide and we are SO excited to have them join the Adelady family. In addition to their original peach and apricot chocolatey delights, Menz also produces the irresistible JeliChocs range (Raspberry, Turkish Delight & tropical fave, Mango!). Plus a delectable range of chocolate-covered products, including classics, PeanutChocs, Fruit&NutChocs and the crowd-pleasing Menz Choccy Snakes. Menz are always developing exciting new temptations and we can’t wait to share their flavour-explosive FruChoc recipes, every month. Menz FruChocs may have balls, but they’re Adeladies through and through!